Update for 2017: Updating this recipe to emphasize the most important step to grilling chicken breasts. Pounding the thick end of the breast down to an even thickness with the rest of the breast is the most important step for even cooking. 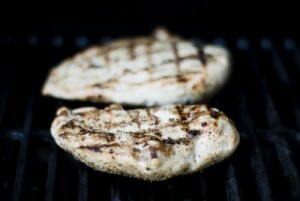 Chicken breasts are one of the most popular and also one of the easiest items to grill. It's also easy to produce chicken jerky if you don't know what you are doing. 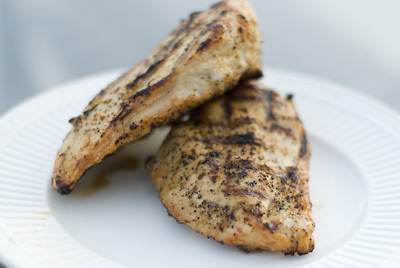 These step by step directions will show you how to easily grill delicious, juicy chicken. There are so many variations with rubs, sauces and marinades that we could probably do a whole site on chicken. We will cover some of these variations in time, but this article focuses on how to grill a chicken breast properly. The great thing about boneless, skinless chicken breasts is that you can cook them over direct, high heat without much risk for flare-ups since they are so lean. This means you can cook them really quickly and sear in all of those juices. The directions below are for relatively thin chicken breasts, less than an inch thick. People always ask how long to grill chicken breast, but times may vary based on the thickness of your breasts, heat of your grill, etc. For these reasons, we can't recommend more strongly the use of a good, instant read thermometer like the Thermapen. Your target temperature is around 160 degrees. Ok, we know you are ready to get started, so let's take a look at step by step directions. 1Light the grill and leave it on medium high for direct heat grilling. Make sure you clean the grates! 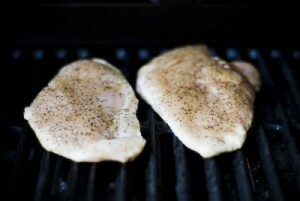 2Rinse the chicken breasts under cold running water and then blot dry with paper towels. 3Here is the biggest tip. Using a heavy object and some wax paper or plastic wrap, pound the thick end of the chicken breast to flatten the entire breast to an even thickness. This is key to getting an even cooking, tender grilled chicken breast. 4Rub the chicken breasts with a little olive oil. 5Season you chicken with whatever seasoning you like. This could be as easy a little kosher salt and some fresh ground pepper. 6Place the breast on the hottest part of the grill and don't touch them for about 2 - 3 minutes. People always ask us how long to grill chicken. The answer has a lot of variables, but the chicken will actually tell you. As shown in the photo below, you can actually tell that the chicken breast is cooking through, they will get more and more opaque as they cook. Wait until the opaqueness is showing through to the middle of the chicken and then it is time to flip. If you try to flip them too quickly, they will stick to the grill. 1Using tongs, lift each breast, rotate 45 degrees and then place them back on the grill. Presentation is half the battle and this will create some impressive grill marks! 2After 2 to 4 minutes, lift the chicken breasts with tongs and flip them over. 1Grill for 2 more minutes and then rotate again 45 degrees to make our grill marks on this side. 2Continue grilling for another 2 to 4 minutes and you should be done! Again, to be sure, use a good instant-read thermometer like the Thermapen, along with our free MeatTemps iPhone app to check the internal temperature of your chicken. For thicker breasts, you may need to close the lid for 5 minutes or so to cook them all of the way through. 3Remove the chicken breasts from the grill and place on a plate. See, we told you this was easy! You can even keep a bag of frozen, boneless and skinless breasts in the freezer for last minute meal options. Remember, not everyone loves steak (I know, weird right?) so it's always good to keep some frozen chickn breasts around to throw on the grill so those folks have something to enjoy. Try them with some greek seasoning, they'll be delicious! Pick up a VillaWare Pizza Grill and use this chicken recipe as the filler to some killer grilled quesadillas. 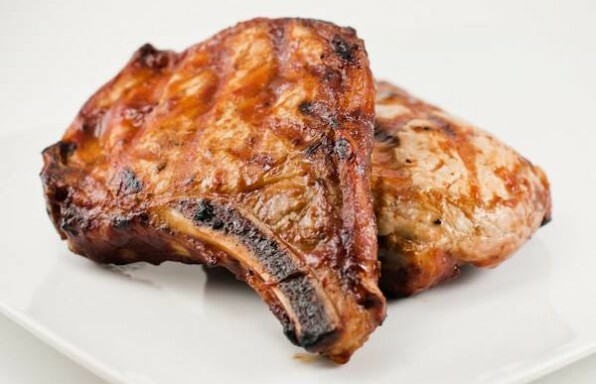 As always, be sure to check out our other grilling recipes for more cookout ideas! Do you mean turn 90 degree? Something not mentioned…dust grated with a paper towel covered in olive oil (or some oil) before grilling. This will help prevent sticking when turning. People always ask me how I grill such perfect chicken breasts every time! I tell them it’s so easy! Just follow these directions and your chicken will come out awesome every time!! Thanks so much!! I have to agree, this is a great recipe. I like the pounding of more even cooking! Delicious! Simple straightforward step by step instructions. Worked like a charm! Wow! Even giving hubby the directions to cook using high heat made me nervous! He was about to grill them using low heat and I would have agreed. I pounded them out as directed and they were so tender. Thanks for the awesome advice! This was an excellent guide. I just got a grill and my first masterpiece was grilling chicken breast with my girlfriend. Thank you very much! Thank you so much..my family and I enjoyed the chicken so much!!! This website is my go-to for grilling! These are great directions. However, you don’t mention wether to open or close the grill lid during the first ten steps. Do you leave the lid open the whole time and close it ONLY if your chicken breast is thicker? Wow, so simple! Pounding out the thicker side to even the thickness of the breast really helps. It was moist and tender – everyone liked it! Best boneless chicken breast I’ve ever grilled.